spanned the globe. It is history in narrative style. The historian, Lawrence Stone, described the use of narrative for this purpose as ‘organized chronologically; focused on a single coherent story; descriptive rather than analytic; concerned with people not abstract circumstances; and dealing with the particular and specific rather than the collective and statistical’. This book describes events, which took place over many years. Every attempt has been made to present those events in a way that the underlying essential principles are clarified. In the chapter China Doll, for instance, the testimony of a solitary witness, in a single hearing room, over a few hours on one afternoon, draws the facts of a highly elaborate terrorist plot together. Crisis in Vienna is about the daughter of an American partner of a Greek shipping magnate, Sandy. Sandy’s father and mother, a French-speaking woman from Liechtenstein, divorced when she was 12 years old. Sandy’s father, realizing that he has his hands full trying to raise her, in time-honored fashion, sends her off to a residential finishing school in Switzerland for the daughters of the very rich. In essence, these schools prepare young women to become the wives of wealthy and powerful men, and are known in the vernacular as China dolls. For Sandy, this is a fate worse than death, and in the magical thinking of an adolescent, she grows to regard her father in less than sterling terms. When Sandy thinks her life is irredeemably and utterly bleak, Sarah arrives at the school. The two, drawn together by kindred spirits, become the best of friends. In Vienna, Sandy now a young woman and her friend Sarah trigger one of the largest diplomatic crises in modern history, simply as a means for Sandy to teach her father a lesson. However, in the process, they create a situation, where Soviet and American agents are in battles on the narrow pathways of Vienna. Vienna, a grand Old-World international city, is known rightly in the grey world as a nest of spies. In a world apart, an Israeli head of state grapples with the imponderables that the three main cultures present, and runs a program, which allows any Arab, Christian or Jew to resettle, when cultural difficulties make it impossible for them to remain in the Middle East and live together. For example, when Jews and Arabs fall in love, the young will always be vigorous. Or, the horrible responsibility an eldest son (in a traditional Islamic family) has, if one of his sisters becomes pregnant before marriage. A brother and sister under these circumstances could seek the assistance of the Prime Minister of Israel, and emigrate to a welcoming country. The program is highly secretive, and demonstrates the great lengths that one head of state goes through to make it possible for those communities to live in peace. Nevertheless, all her good intentions are about to unravel, because an Israeli boy is interested in an Israeli girl, who is interested in an Arab boy. Acts of revenge between individuals and small groups are so commonplace their importance is overlooked, habitually. All too often, history tells us that what begins as a dispute between individuals, pit whole communities against one another, and disputes between communities unsettle nations. There is very little written about this aspect of conflicts, but it is an important aspect nonetheless. 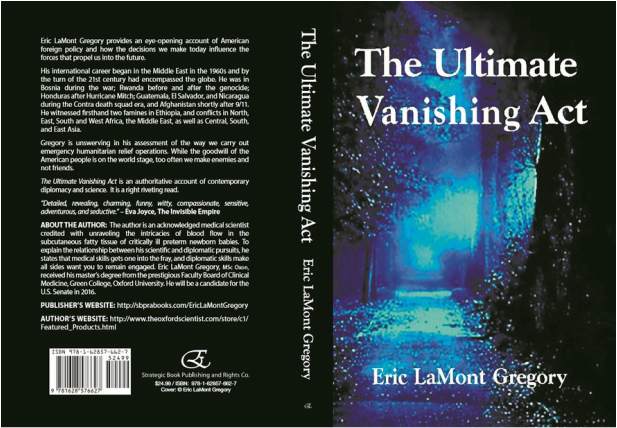 The Ultimate Vanishing Act is also about the nature of superpower relations, and concerns the bilateral Arms Limitation Talks and what came to be known as the Helsinki Accords. It covers a period of American history when there was for all practical purposes a caretaker government in Washington. Unfortunately, while America was mired in the heart-wrenching days of Watergate, world events did not slow. Watergate eclipsed the 1973 oil crisis in the headline news, but not in the larger sphere in which international affairs are carried out. A number of crises were not attended to properly during that time and ever since, the United States has been embroiled in conflicts, whose origins stem from that era. In America, the conservative half of the elected federal government dreamed of the day when they could force a Democratic president to resign, while, at the same time, an American ally, now rich beyond imagination, decided to use its new found wealth to agitate for the revitalization of Islam in the Southern Republics of an unraveling Soviet Union, stretching from Belarus to China. The Saudis utilized the nations of Afghanistan and Pakistan (two nations that exist in name only, but are as Charles de Gaulle described them, a collection of tribes) to launch incursions into the former Islamic Soviet Republics. They bombed buildings, especially the Soviet administration buildings that were located in what served as mosques prior to 1917 and assassinated Soviet officials. The Saudis sparked the problems in Central Asia that drew the US into a surrogate war with the USSR, which continues to engulf that region of the world to this day. The Soviets raised two rather thorny issues during The Strategic Arms Limitation Talks (SALT)—proxy warfare and a no-first-strike clause (which for all practical purposes would have meant an end to the likelihood of a direct nuclear confrontation between the USA and the USSR), but without direction from the Ford Administration, those proposals went addressed. A subtle nuance in the communist worldview also occurred at that time, one that altered the doctrine--from each according to his ability, to each according to his needs to a construction that more closely approximates a free-market concept--from each according to his ability, to each according to his work. The idea of compensation according to one’s work was thought uniquely non-communist. Yet, in an America where one's stand on the USSR could still win national elections, little attention was paid to what amounted to a major step by the Soviets in the direction of a market economy, as it were. Superpower relations are never unimportant, but they are not always given the attention they deserve. The Ultimate Vanishing Act provides a unique view of those relations. An End to War is about a multi-generation long conflict in Southern Africa, and poses some answers the question as to how wars come to an end. One answer is wars often come to not very dramatic conclusions, a whimper and not a bang. An End to War is a behind-the-scenes look through the eyes of individuals who understand the workings of the upper chambers of the executive branch of government. It is an intriguing way to organize an effort to end a war by interacting singularly with heads of state and their top advisers. First, you must hunt for that one person in the entire executive branch of government, who can place you in a hallway the chief executive is going to walk through for a mere 30 to 60 seconds, while going from one meeting room to the next. And, because the executive sees you standing next to that person, they approach you. The head of state does not ask; what can I do for you? They ask; what do you want me to do, and please be specific. You respond; call the Ambassador from Angola into your office, present the disturbing information that has come to your attention and ask them to respond. The chief executive asks you if the information is verified. The person who arranged the hallway meeting standing next to you, raises his hand, palms exposed, and nods his head, yes. At that point, the chief executive asks you; what will that accomplish? You respond; it will end a war. You stand eyeball to eyeball, no one speaks for ten seconds, before someone inevitably comes up and says; Sir, we must move on. The head of state leans slightly forwards with both hands extended, thumbs up, shakes your hand while placing his other hand on your upper arm and walks away. You remain still, your eyes fixed straight ahead, until the person standing next to you lets out an audible sigh. Only then, does one know that you are one step closer to ending a war. You do the math—by the time that trip is over, you have traveled over a thousand miles and the total meeting time with the relevant parties, the prime minister, the foreign minister, and their chief of intelligence comes to a grand total of no more than five minutes. But, every second of it was worthwhile. The war is one step closer to ending. In the immediate aftermath of 9/11, the government believed a fierce (shocking and awful) few months of actual war, and the perpetrators would be captured or killed and that aspect of the whole distressing affair would be brought to a swift and justified conclusion. In reality, there was more than ample time to address other matters. And, two skilled international operatives set out to do just that. Namely, they plan to end a war and involve the executive branch of governments only—no print or broadcast media, no legislatures or courts, no international organizations, governmental or non-governmental, no Security Council Resolutions or lengthy debates. China Doll foretells of international terrorism in the near future, and how the new science of very small things actually works. When our machines rise into the lofty atmosphere, we confront threats that are not a problem at sea level. That is why aircraft must have very special protection on all their electronics—to shield them from wavelengths of the electromagnetic spectrum that will interfere with them at 35,000 feet and above. That is what would have happened, if it had not been for one international scientist from the US alerting authorities, who were then able to act before any of the planes loaded with the nano triggered bombs concealed in toy dolls took off one night. But, unforeseen human factors delayed transfer of critical information from a US senator’s office to the intelligence services, and a second error placed two crates of the dolls on a plane that was flying across the Atlantic towards Paris. The nano-dust scenario is terrifying to be sure, at the same time, working at the nano-technological level portends significant advances in our understanding of the world around us. Albeit in a dramatic fashion, I trust you will find China Doll a thought-provoking introduction to the nano-dimensional scale universe, where we can manipulate a single atom and even minute parts of an atom. There is a lot of room at the bottom, after all. Whoever eschews a face-à-face meeting with a former adversary breaks one of the cardinal rules of diplomacy and statesmanship -- always show up for a showdown.